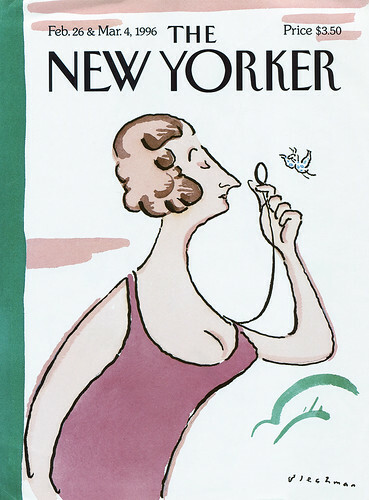 Between 1974 and 1996, R. O. Blechman created fifteen New Yorker covers, many of which have become famously iconic, including his first and last, write Genevieve Bormes, Covers Associate, and Françoise Mouly, Art Editor, The New Yorker. 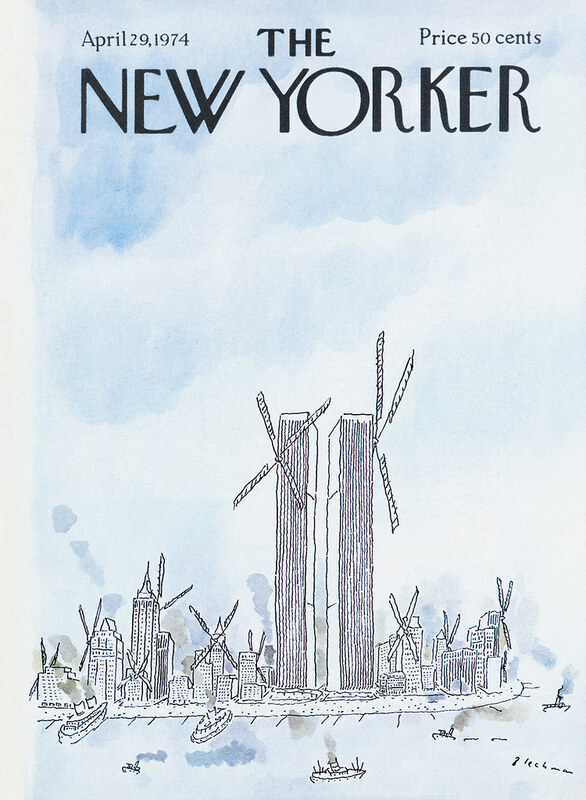 The first, ‘April 29, 1974’ (note: New Yorker covers didn’t receive titles until the era of Tina Brown’s editorship, from 1992-98, so until then they are known by their cover dates), depicts the New York City skyline, including the recently erected World Trade Center, with all its buildings converted into windmills. 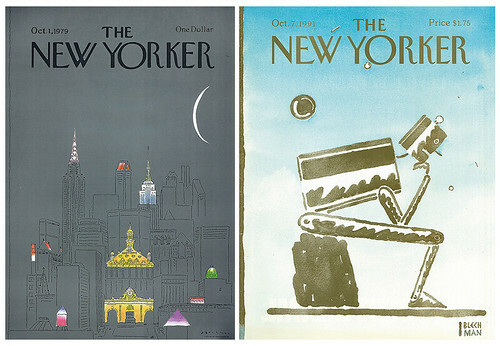 Many of his covers pay homage to the city he clearly loves. ‘December 22, 1975’, which shows the city encapsulated in a snow globe, remains a classic. ‘October 1, 1979’ shows the gem-like lights of the city at night, while ‘October 31, 1977’ shows the sky filled with aircraft, ranging from early airplanes to hot-air balloons to an alien ship. ‘March 7, 1977’ shows a whimsical hand-glider at the beginning of spring. ‘October 1, 1979’ and ‘October 7, 1991’. Other covers offer a playful take on holidays. On the ‘December 19, 1988’ cover, a Christmas tree goes rogue. ‘December 17, 1990’ shows classical statues entwined with tinsel and lights. In ‘January 2, 1978’, a child peeks through a celestial curtain at the coming of the New Year. ‘November 2, 1981’ shows eager trick-or-treaters as seen through the eyes of a Jack-o’-lantern [a carved pumpkin face]. ‘July 2, 1984’ and ‘July 7, 1986’ celebrate the 4th of July. One of our favourites, ‘May 14, 1990’, celebrates Mother’s Day with a wry portrayal of Whistler’s Mother (aka Arrangement in Grey and Black No.1, 1871), unmoved by the gifts piled at her feet. Blechman did not limit himself to commemorating yearly milestones, though. ‘July 21, 1975’ pokes fun at a group of lawn-conscious neighbours. ‘October 7, 1991’ depicts The Thinker, a symbol of man’s intelligence. However Blechman’s man, unlike Auguste Rodin’s famous statue, is replaced by a robot. 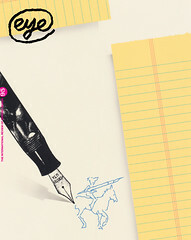 Blechman’s last cover was published when the stakes were high, back in 1996. Tina Brown was editor then, and many die-hard New Yorker staffers and readers were loath to open up to the changes she was seeking. A mid-February anniversary issue was coming up and many wanted us to adhere to tradition and reprint the original Regency dandy known as Eustace Tilley, drawn by Rea Irvin for the magazine’s first issue in 1925. We approached many artists, but Blechman’s ‘Eustacia’ was one of the few that gathered consensus around the office. R. O. Blechman’s image of Eustacia had everything that makes his work so memorable: wit and concision. It was a perfect match to Rea Irvin’s archetypal original cover. And, like all of Blechman’s contributions, it helped the magazine navigate a new era, without losing any of its charm and sophistication. The New Yorker, 26 February and 4 March 1996. Top: The New Yorker, 29 April 1974.